Record cold temperatures and power interruptions are predicted for the winter months ahead throughout the United States, making it difficult for consumers to keep their homes comfortable. To ensure homeowner and community safety throughout the remainder of the winter, Blossman Gas is committed to educating consumers about the safe use and storage of propane appliances and cylinders. Blossman Gas www.blossmangas.com has developed several important tips to remind homeowners how to store cylinders and use their propane appliances, such as space heaters, safely and efficiently. Never use or store a propane cylinder in your home or any other enclosed space, such as a garage. When transporting a cylinder or when it is not in use, keep it secure in an upright position with the cylinder valve turned off. Make sure to read the warning labels attached to the cylinder. Don't use, store or transport propane cylinders where they can be exposed to high temperatures because the pressure relief valve may open, allowing amounts of gas to escape. Use only heaters intended for home heating; check manufacturer's instructions for intended use. For both types of space heaters, it is essential that the space above and around the unit be free from any combustible materials, such as draperies or plastics. Double-check your manufacturer's instructions for clearance distances, which vary widely depending on the type of unit. Keep space heaters running in proper shape by scheduling a periodic check-up. Always have your space heater inspected by a qualified professional if it has been subjected to flooding or water damage. 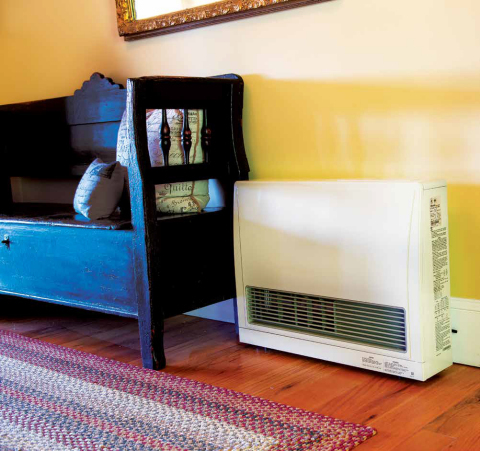 Make sure the room or space the heater is installed in is large enough to provide sufficient combustion air. This is especially important for vent-free heaters. Check the manufacturer's instructions for guidance. Finally, homeowners are reminded to use their appliances in accordance with manufacturers' recommendations. This includes scheduling periodic inspections, maintaining proper clearances above and around appliances, and contacting only qualified service personnel to perform any repairs. Safety tips provided in part by the Propane Educational Research Council (PERC). To review Blossman’s Winter Catalog showing the latest in home heating appliances, and generators go to http://www.blossmangas.com/Appliances. Blossman is now offering 20% off propane zone heating products through December 31st, 2015. http://www.blossmangas.com/Company/Current-Promotions. For a Blossman Gas store nearby to you, go to http://www.blossmangas.com/Propane-Benefits/Contact?search= or call 1-888-BLOSSMAN. Blossman Propane Gas, Appliance & Service has been providing the comforts of propane and propane appliances to families throughout the Southeast and Mid Atlantic for more than 60 years. Servicing customers in 12 states from 73 branches, the family-and employee-owned company sells more than 85 million gallons of propane a year. Showrooms provide demonstrations and expertise on most national manufacturers of ranges, cooktops, water heaters, generators, gas grills and gas logs. Leading the industry in technician training, Blossman is a full-service company that provides everything from propane delivery to appliance sales, installation and service. For more information, call 1.888.Blossman or visit www.blossmangas.com.